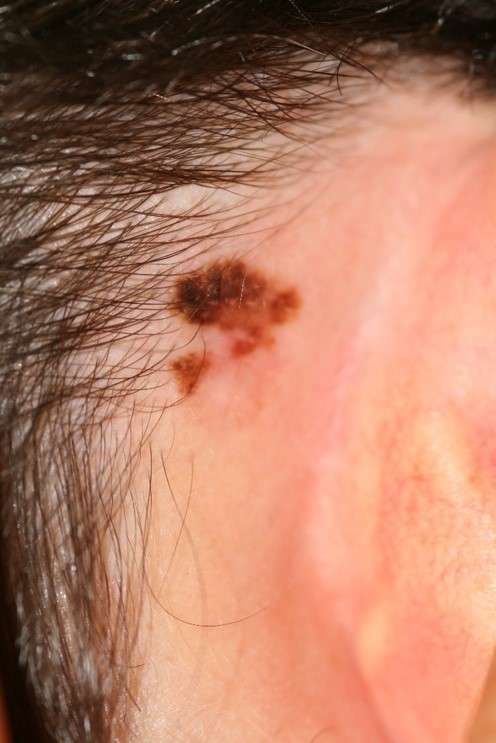 If an ear tumour is spotted and treated early, then even the most serious type of cancer, melanoma, need not require the removal of the whole ear. A red, scaly or bleeding area which will not heal or keeps reappearing is best removed and the tissue sent to the laboratory for investigation. Such surgery need not spoil the appearance of the ear, but the earlier an ear tumour is removed, the easier the ear is to reconstruct. Simple techniques involving excision followed by reconstruction with a combination of flaps and grafts are the easiest and least invasive. In some patients, the skin of the helical rim is slack enough to permit direct closure when simple lesions such as small basal cell carcinomata and chondrodermatitis nodularis helicis chronica are removed. Incisions along the helical rim margin are particularly easy to close. When the skin is tight then that on the posterior surface can be rotated onto the rim to assist closure. The skin on the posterior ear is less adherent and defects on the postauricular surface can often be closed directly. The scar is hidden in the groove behind the ear. Sometimes the ear is pulled a little closer to the head in the process. If the perichondrium can be preserved then a full thickness skin graft is an ideal reconstructive solution (Figure 29.7). Both preauricular and postauricular donor sites are available. For lesions of the conchal hollow, a skin graft is a good form of reconstruction even if cartilage is excised (Figure 29.8). The raw soft tissue behind the conchal cartilage will readily accept a skin graft. Small defects at other sites can be reconstructed with skin grafts but it is important to preserve a round rim of cartilage and skin behind the defect. Without cartilage the helical rim margin will collapse postoperatively. When large defects of the ear are excised, preserving the underlying perichondrium, then large split thickness skin grafts will give excellent results (Figure B). Defects on the helical margin can be removed as a small wedge. Some elderly patients with skin tumours have oversized ears (7–8cm tall) and a small reduction in overall size is not readily apparent. 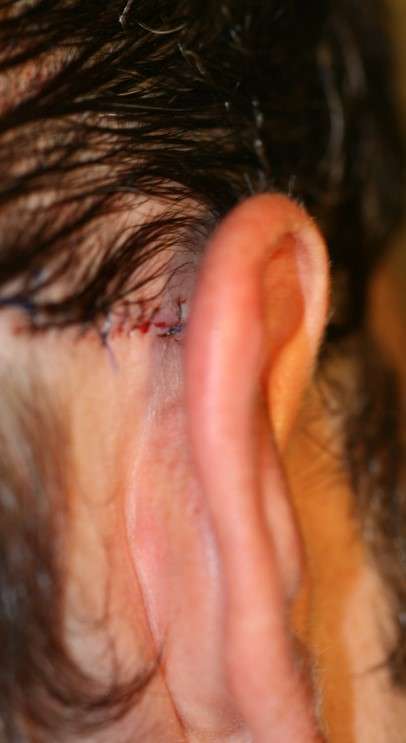 A simple wedge should always be modified with small lateral extensions to prevent cupping of the ear when the components are joined (Figure 29.9). In the Antia and Buch technique (a modified wedge), the available circumference of the ear after tumour excision is enhanced by advancing (stretching) the locally available tissues along the helical rim (Figure 29.10).7 Large peripheral flaps of the adjacent helical margin are based on a wide postauricular skin pedicle. The earlobe varies in size but in most patients loose tissue within the lobe can be advanced along the rim of the ear. This is a useful technique as the flaps are a good match for the missing helical rim. A single flap will suffice for small defects but for larger defects the intact cephalic segment of the helical rim can be advanced into the defect as a second flap. Extension of the flap’s triangular tail into the depth of the concha leaves the ear with a pleasing shape. The chondrocutaneous rim tissue is mobilized on a very wide and highly vascular pedicle and accurately apposed with fine sutures prior to skin closure. Defects on the posterior surface of the ear may be repaired by rotation flaps or transposition flaps. In the case of transposition flaps, the donor site is located in the posterior sulcus so that when this is closed, the ear is simply approximated to the side of the head. A large skin flap from uninvolved postauricular and adjacent mastoid skin can be used to reconstruct defects on the anterior surface of the ear. Such a flap can reach the concha and the scaphal hollow. It is easy to use and the colour match is ideal. A posterior skin flap is outlined and undermined in the postauricular sulcus at a zone corresponding to the defect to be filled. A central pedicle of subcutaneous tissue is preserved. When the ear is pushed back the flap is delivered through to the external defect and secured. The donor site is closed directly. An alternative to a subcutaneous pedicle is a de-epithelialized pedicle of dermis. Such postauricular flaps are also flipped through the ear to the external surface and used for reconstruction of central ear defects. If both a superior and inferior dermal pedicle are preserved, then the flap is rotated into the central ear defect in the manner of a swinging door (Figure 29.11). It is important to keep the donor defect elliptical in shape to allow easy closure. Wide undermining beneath the epidermis in the corners of the opening will allow substantial pedicles of dermis and subcutaneous tissue to nourish the flap. Small preauricular flaps and flaps from the concha can also be used to reach the external auditory meatus. When large tumours of the ear have been resected, then reconstruction will require some structural support to replace the missing cartilage. Small defects can be replaced by conchal cartilage grafts from either the same or the opposite ear. The curve of these cartilage grafts can be put to good use in mimicking a helical rim. When the missing segment is extensive, a carved costal cartilage framework is required.8 Complex shapes can be tailor-made to fit the defect after tumour excision, and this technique of reconstruction gives excellent results. In the age group that presents with auricular tumours, however, some patients are not keen on the additional discomfort of harvest of costal cartilage, and a number will opt to be fitted with a prosthesis.